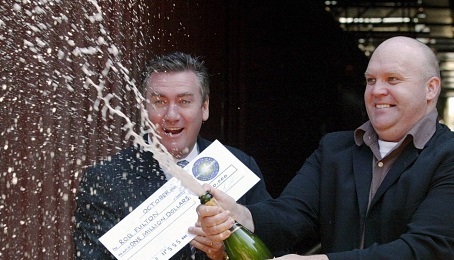 As Rob celebrates his win, host Eddie McGuire seems surprised at the champagne’s behaviour. SH: What was your strategy about when to use the “50/50” lifeline? RF: At $250K, this strategy was simple – get rid of two answers and pray that it left an obvious answer. I was really very lucky in this instance. In the wild, which tiger is the biggest of the big cats? RF: I was most likely going to choose “Bengal” over “Siberian” Tiger, but using the lifeline removed “Bengal”. It was a fortunate escape. SH: What was your strategy about when to use the “Ask The Audience” lifeline? RF: At $500K, my strategy was to go for an answer that was opposite to the audience. Which Ivy League university awards the annual Pulitzer Prizes? RF: In fact, my pre-game thoughts were to go for the 3rd most popular choice. That would have been “Princeton”, I think. I really didn’t think that Harvard or Yale were the answer. All I knew about Princeton was that Albert Einstein used to teach there. The main thing I knew about the Pulitzer was that The New York Times had won many of them, so therefore I used the New York association to opt for Columbia. Incidentally, you can watch Rob’s last three questions (the $250,000, the $500,000 and the $1,000,000) right here on YouTube. SH: What was your general strategy for answering questions on the show? RF: First rule: READ THE QUESTIONS THOROUGHLY!!! I can’t overstate this. I don’t know how many times I’ve seen people bomb out because they misread the question. A silly error like that could cost you thousands of dollars! Secondly, Millionaire is as much about RULING OUT answers as it is about knowing the right answer. RF: Not so much. Maybe “fortune favours the brave”, “fortune favours the prepared mind”. I was probably focusing on breath control. SH: How did you keep your cool when the stakes were so high? RF: I may have looked cool (?) but I was a bundle of nerves. The thing that kept me going was the promise that I kept to myself about going as far as I could go. The money really was incidental after that. I think I said to Eddie that I was trying to pretend I was playing the DVD version of the game. SH: How did you feel at the moment when you won the million? And how did you feel in the hours, days and weeks afterwards? less than flattering. I was naive to think everyone would enjoy the moment. Hmm. Well, that’s showbiz, I guess. Next week, Rob talks about how The Big Win changed his life, and offers some great tips for anyone considering applying for Millionaire. So if that’s you, you won’t want to miss that! And just a reminder that all of the questions from Rob’s game on Who Wants To Be A Millionaire are still over at the howtowingameshows Facebook page, if you feel like tackling them, to see if you’d have fared as well as Rob did…. * For those playing along at home, the correct answer is (B): Siberian. ** For those playing along at home, the correct answer is (A): Columbia. This entry was posted in 'Who Wants To Be A Millionaire', Game Show Winners, Interviews, Strategy, Tactics, Updates by Stephen. Bookmark the permalink.